his week is Thanksgiving week in the US. It is one tradition that my adopted country has taught me to appreciate; that and Black Friday shopping (joke). But seriously, Thanksgiving is one day that is specially dedicated for giving thanks and being surrounded by family. 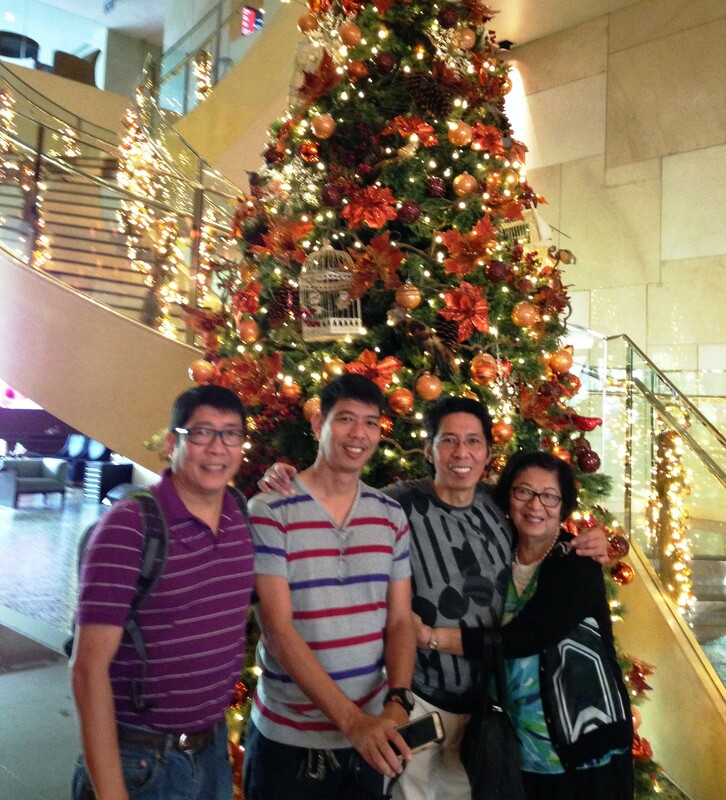 Christmas evoke the same feeling in me, especially if celebrated in the Philippines. This Thanksgiving I am blessed to celebrate it here in the Philippines, where I am on business. Although I will be celebrating it away from my wife, kids, and Ethan (my grandson), I could not pass up the opportunity to see my mom, brothers, and their families here. It is my time to say thanks to them for their prayers and support. It is about being with them sharing stories rather than a formal sit-down-turkey-eating-football-watching day. Also, I wanted to see the look in my mom’s face when I surprise her by being here. She did not disappoint me. Picture this: Sunday, Nov. 23, I arrive early morning. My youngest brother, Raul, picked her up and along my other brother, Rene, who suddenly arrived from southern Philippines a day earlier. Rene gave the lame excuse he had to take care of some banking matters in Manila. (My mom was already wondering why go to Manila when there are major banks also where he lives…hmmm). Mom was unware of my arrival, so all three went to my hotel Sunday morning on some flimsy excuse. Mom stayed in the car with Rene, while Raul got me. My mom always has this infectious habit of praying the rosary to while passing time and she was deep in prayers as I saw her walking up to the car. I walked to her side and knocked on the door and opened it saying. Light. Camera. Action. To say that she was crying, shouting, flailing, in total disbelief, shocked, crying again and shouting (you get the picture) is an understatement. It was a if I appeared in god-like manner as she was praying. When she finally settled down and managed to speak she just hugged me, and I lost it. I felt her warm love wash away the pain of cancer. It was like being born again as a baby. A mother’s embrace is so nuturing and enduring that it can give you back your life and fill up any emptiness. My mom has already given me so much that I wanted to give back too by being here with her. In that moment, my Thanksgiving was complete and was thankful. Fate has somehow conspired and aligned everything just for me to be here with her: the unexpected business trip to Manila, the timeliness of being off chemo treatment during the week, the clearance from my doctors to travel, the stable scan results, the circuitous route I took due to flight delays and miss connections (Chicago/Tokyo/Guam/Manila), and the support of my family back in the US. For all that and more I am very thankful. Unfortunately, there is no video of the Thanksgiving surprise to share, but you get the picture. The moment is etched in my memory along the strong feelings that goes with Thanksgiving 2014. It will become part of my cancer journey of Thanksgiving. I read back on what I wrote last year and the message was still the same for me; be thankful for all all your blessings. Happy Thanksgiving to you and your family. 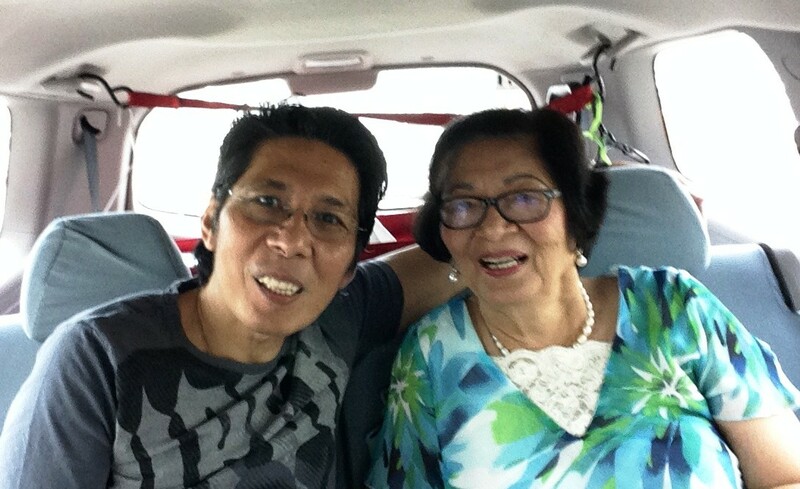 With mom in car after she recovered from shock. At the hospital: Wednesday, November 12. Hmmm…. Not very many people today. The waiting room is not full and it is already the middle of the morning. I checked in and sat to wait for my name to be called. The normal routine is to get my vital signs, like weight, blood pressure, temp, pulse, and oxygen saturation. Then they take several vials of blood for the study and lastly, they access my port. This is my weekly routine unless I have a chemo break. I practically have memorized my vital sign stats and at times I would play a game with the nurse tech to guess exactly my weight, BP, pulse, temp. With the weekly blood test, I know the results my kidney function, blood work, platelet count, and other details enough to understand them. Then I have monthly CT or PET scans to monitor my tumors. I know every change in my body and the impact of my exercise and vegetarian diet as a result of these weekly tests. These weekly routines give me a sense of stability or normalcy, and I am thankful. Also, I have mentioned it before, it helps me be grounded with my priorities. Outside the hospital, there is the hustle and bustle of life: the text messages, the email, conference calls, bills, etc., but these are temporary and insignificant when measured against health and family. My routines at the hospital allows me to see things differently. I am glad I am given that opportunity and share this with you. Thanksgiving is coming up in a couple of weeks. I am looking forward to it because I will celebrate it differently this year. If all goes well, it will be a special Thanksgiving. One more round of chemo on November 19, which is also the birthday of my daughter Abby, then Thanksgiving week. I will definitely write about it. P.S. I am still wearing a boot to help heal the fracture in my right foot. Hopefully, the doctor tells me I can remove this thing. Then it is rehab time. Round 10: It’s a miracle. He’s back. He is an old gentleman who comes regularly to accompany his wife for her treatment, and he talks to everybody. And I mean everybody. You would think he is a politician or have made a career in radio but no, he is just folksy friendly. This time around we were the closest one in talking distance of his booming voice. He had shuffled in pushing his wife in wheeled chair and sat near us. “No commercial interruption! Like a satellite.” Then chuckles. Ha…ha. Whatever. Nonetheless, I love scenes like this. The conversations in hospital waiting rooms are so animated and at times, downright hilarious. It is open and well-meaning. Everybody is here for one purpose: to get well. You learn a lot too, like cancer does not discriminate. Also, you can find your sense of purpose by listening and seeing examples of enviable love. Take this happy old couple. They must be in their 80s having been married for 58 years. She goes to her chemo and he goes with her. Some cancer patients would just have given up when diagnose at that age, but not her. She is here, wanting her chance at extending her life. Chemo takes a toll on you and yet she goes, and with her: her husband. I am no match for this lady’s bravery; more so, for the dedication of the husband. He is the miracle. Both of them are. They are amazing. Then the nurse calls them, it is time for her treatment. He bids goodbye then slowly shuffles along to follow her. I should be in NYC now on the even of the NYC marathon. I am feeling well, recovered from my last treatment, and would have run tomorrow’s race with my wife. Instead I am home and will be watching the race tomorrow on TV. I am still chained to my boot but healing well according to my doctor. They took a comparative X-ray of my foot and it showed good progress, but I still have to wear the boot for three more weeks.